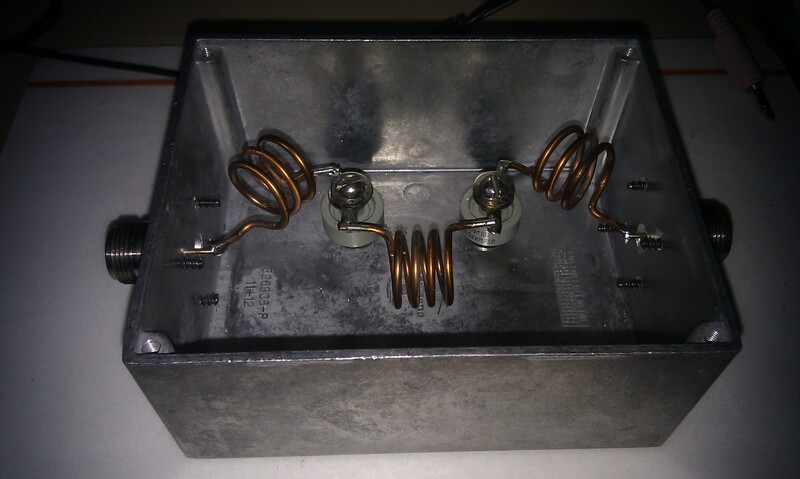 The following photo shows the home made filter based on OZ2M’s design. At the time I was gathering the parts to build the LPF I happened to spot a listing for four 56 pF door knob capacitors on a well known auction site with a buy-it-now price. Fortunately I was at the right place at the right time to purchase them so the biggest challenge in terms of parts was sorted. I found that an aluminium Eddystone Die-cast box (120mm L x 95mm W x 57mm H) was an ideal size for this project. Having only very basic test equipment available to me I was very careful to follow the dimensions and layout as described on OZ2M’s site. By looking at the 2nd harmonic I was able to check and verify that the filter was “working” but I had no means of plotting the filter curve and accurately measuring its characteristics. Here’s the plot (full size) that shows that the 4m LPF is performing as intended. The key points of interest being: 0.14dB through loss at 4m (and 0.30dB at 6m) with around 60dB attenuation on the third harmonic.